visorview: Mumbai Marathon – how "I ran well in Jan"
Mumbai Marathon – how "I ran well in Jan"
But the Mumbai Marathon was sabotaged even before it began. Three marathons in 3 months, with the 78km Ultra marathon just completed. There was hardly any time for sore muscles to heal, the submicroscopic damages had to wait. The 4-hour noon-run at Nandi hills with Nischal and Athreya did more harm than good. Work threatened to play spoilt sport as well. With days to go before I would leave to Mumbai, there was unprecedented work-load, even as I went into the carb-binge mode. With two days to go, a reject from a job offer, sent me spiraling down into a depression. I had very little time to regroup myself. I stayed in Mumbai at my Brother-in-Law’s apartment in Andheri, cooking rice and boiling my potatoes – the Australian Open took my mind off the more persistent problems. On Friday evening, I was treated to some yummy pasta dinner at Rajesh’s place. We then went across to another friends place and then met this girl called Anandita – a creative writer, she looks straight out of a Opera musical. I’m never the one who’s a fan of Karmic healing, Reiki and the likes. But, man, she was good, working on my Aura, and in no time, she got to telling me all the things that were bothering me. She advised me to be confident, be patient and relax. It helped a bit. What helped more was a mail that found its way into my inbox “… all the very best. I am sure you will do great”. 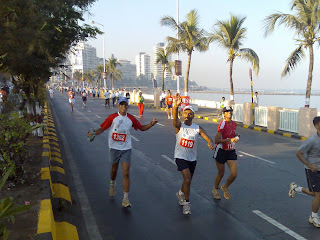 The Marathon eve was spent in driving some 2 hours from Andheri to Nariman Point to collect my Bib No. 1362. Also got to do a bit of recce of the run route, my first time at Mumbai and I wanted all the information I could get. At the Pasta Party at Moshe’s, we packed ourselves with loads of carbs and the all-important RFL camaraderie. It was a number story all along - 30 refreshment stalls along the route, serving over 5.6 lakh biscuits, 5834 dozen bananas, 35000 apples, 75 volunteers specifically assigned to distribute refreshments among runners, 89000 liters of water, 12 medical stations, 10 ambulances, 250 doctors on duty, 500 policemen, 1200 security guards, 2500 volunteers and 3 helicopters used for telecast. Major Satish, who was accompanying “his boys” from the Services, had stayed over at our place. 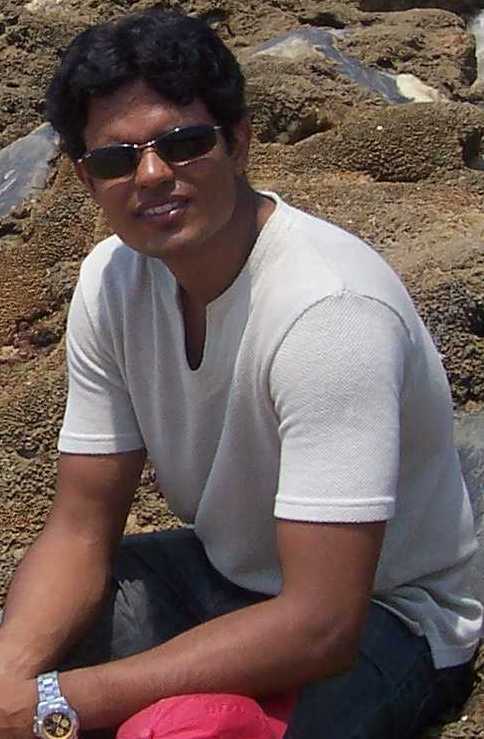 (his boys eventually won the top 7 places in the Indian Men category!!) With all the approach roads to Azad Maidan blocked, taking a train was the practical choice for transport. But it meant that I had to be up full 3hours before the marathon was to begin at 7:45am. I reached CST just as the pack of half marathoners were starting to pour onto the roads. This is one sight that I always miss out on my marathons, when you run the full marathon you can never be around when the celebrity runs begins. Reminds you of Halal, eh? At the holding area, there were lots of familiar RFL faces, most of us were in the Bangalore Ultra tees. I had planned to run with Girish and Nischal. I was using Nitin’s Garmin Forerunner for time-keeping and had set a 5:35-5:45 min/km pace. Girish was nowhere to be seen and Dharam stuck with us from the very beginning. Both D and Nischal had at least one sub-4 finish before this one. I knew I just had to keep pace with them. With the run starting as late as 7:40, the sun was up soon even as we reached Marine Drive. We passed through Chowpatty, Mahalaxmi temple, Haji Ali and Siddhivinayak temple, consistently hitting the 5:40min/km pace. We took a short walk break at the 24km mark, when I passed Shivaji park I had begun using muscle relaxants to ease cramps. We had more than the usual share of cheering from the bystanders and I was pretty excited about it, till Nischal reminded me that I was responding to some of the “Way to go, Superwoman” cheers as well. I desisted from any more waving till I was running alone. The three of us kept the average speed close to 10kmph till the 32km mark. At the exclusive for HASHers water stop, I was looking for more muscle relaxants. As we neared the Peddar Road flyover, Nischal kept the pace going while Dharam and I fell behind. As I walked up the flyover, I conversed with a Doctor someone who was carrying some breakfast home to his family. It was his normal Sunday morning routine to walk 3kms to the restaurant and back. It was nowhere close to a normal Sunday morning for me, though. The pace was slaking by now and with 3kms to go I was down to walking pace. Shyam, who I had first met during the Bangalore International Marathon, joined me with some 2kms to go and we egged each other on to the finish. As I approached Azad Maidan, I pulled out the last reserve of energee left, Athreya who had finished his own in under 4 hours helped me pace my last few hundred meters. I crossed the finish line in 4:29:52 hours. It was also the first time I raised money for charity for a NGO Dream-a-Dream. Many thanks to Sarosh, Raaji, Rishi, Shamji, Adarsh, Sriram, Amit, Keerti, Meena, Malay, Chetak, Ashwin, Shweta, Sod, Satsang and Naveen. I will try to keep you posted on more activities of the NGO. Thanks also to Nitin who lent his Garmin Forerunner 305, while it helped 3 of us keep to the 5:40min/km, the graphs showed more detail than ever required for the post-race analysis. I was so overawed, I simply stared at the graphs no end, darn, it even showed me how fast my pulse raced even when I stopped for a leak!! Check out this and more here. 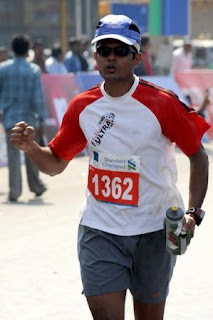 A few days later Nitin shared with me how we had won a contest to upload the Mumbai marathon profile on MotionBased. The blog can be read here. Marathons are no biggies for u anymore, yeah. Awesome stuff. Keep running. BTW, have you read 'Ultra Marathon Man"? Must be a dumb question, as I'm sure all the ultra-marathoners would've read this a few times over.